Did you mispronounce the word spaghetti as a child? I sure did. For much longer than I care to admit. I distinctly remember being asked to say it and I would confidently reply in my little voice, “ba-sketti!” as they all laughed hysterically in response. My husband on the other hand was a child prodigy of some sort and came out of the womb saying spaghetti correctly. Psshh. Whatever. When I asked my Facebook fans last week what they were craving, I got one very specific response; something with spaghetti squash and lentils. Considering the popularity of the burrito bowls, it took all of about 30 seconds for this recipe to pop into my head. 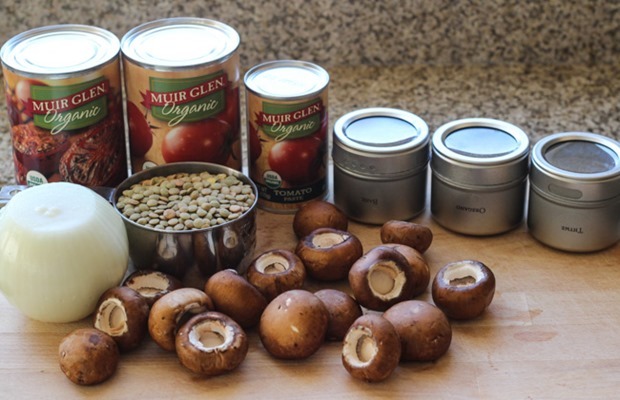 This time we’re combining mushrooms and lentils in an easy homemade marinara sauce to create a “meaty” texture for a filling and satisfying meal. Whenever I cook with mushrooms, I feel compelled to add red wine so you’ll find that in there too. I think it kicks the flavor up about ten notches but it isn’t exactly necessary if you don’t have any on hand. But because I always happen to have some on hand (#imawino), I added some. 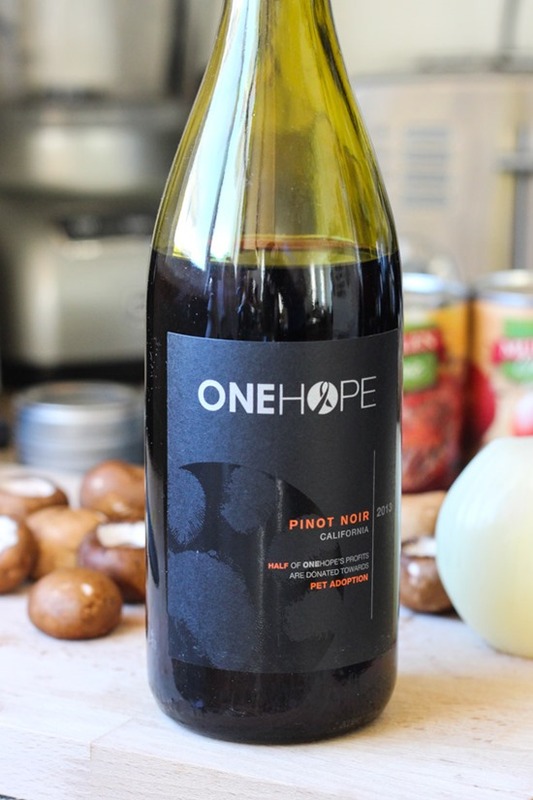 By the way, I’m currently loving One Hope’s pinot noir which donates half of their profits to pet adoption. How freakin’ cool is that?! After that, we top it off with a little Italian cheeesssssse, broil it until it’s golden and bubbly and dinner is served! 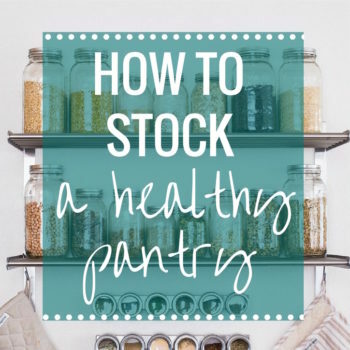 Side note: if you’re only cooking for two, just wrap the other two halves in plastic wrap or foil (or place them in a sealed container) before adding the cheese and store in the refrigerator for up to 3 days. Then when you’re ready to eat, top with cheese and reheat in the oven for 15-20 minutes before broiling. Buon appetito miei amori! Muah! Preheat the oven to 400°F and then line a baking sheet with aluminum foil. Slice of the stem (the top portion) of each spaghetti squash and then cut them in half. Use a spoon to scrape out the seeds and attached soft flesh pieces. Using your hands, lightly rub high heat oil on the insides and then place face down on the baking sheet. I was able to fit all four halves on my baking sheet but you may need two depending on the size of your squash. Transfer the squash to the preheated oven and cook for 40-45 minutes, until tender. Time may vary depending on the size of your squash (shorter for smaller and longer for larger). While the squash cooks, start your marinara by warming one tablespoon olive oil in a large saucepan/skillet over medium heat. Add the onion and cook for 3 minutes then add the garlic and the mushrooms to the pan and sprinkle with salt & pepper. Stir together and cook for another 3 minutes. If you have red wine on hand, pour in 1/4 cup and turn the heat up slightly so that the wine simmers for about 5 minutes. Next add the dried herbs, both cans of tomatoes and their juices and the tomato paste. Cover the pan and continue to simmer for 15 minutes. Then stir in the cooked lentils and cook for another 15 minutes. Once spaghetti squash has cooled enough to handle, gently scrape out about 1/3-1/2 of the middle filling but not the sides. Spoon in 1/2 cup of the mushroom lentil marinara and then top it with the spaghetti squash filling. Lastly, spoon in another 1/2 cup of the marinara on top and sprinkle with cheese. Repeat this step for all four halves then place them facing up on the baking sheet. Turn the oven to broil and place the baking sheet back in the oven for 5-7 minutes, or until the cheese starts to bubble and brown on top. Remove from the oven and garnish with fresh parsley. 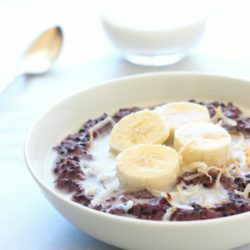 Serve warm with a fork and get ready to dig in! Spghetti totally is a tough word for the little ‘uns. I pronounced it puh-sketti when I was a kid, and puh-sketti nights were always my favorite. I also couldn’t say my r’s cowectly, but that’s anotha stowy. 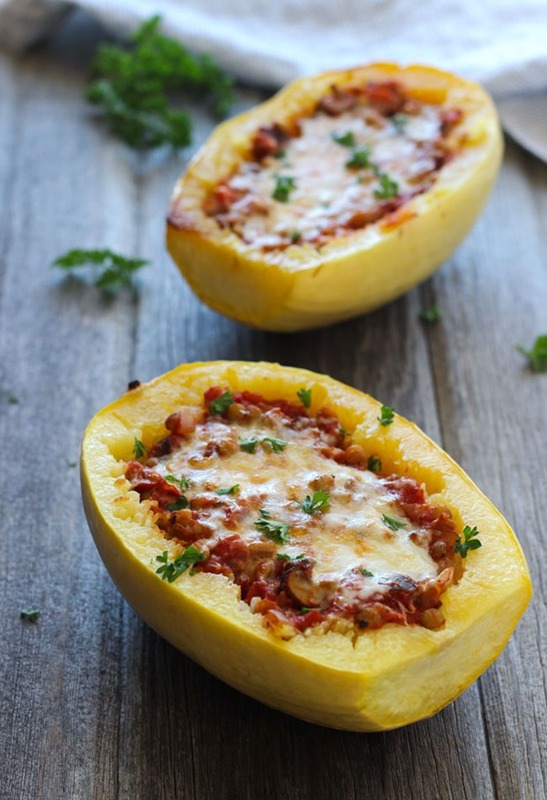 I luuuuvs me some spaghetti squash boats! And the lentil idea is fabulous! So much nutirion and texture in these dang things! I love that this is such a filling, cozy meal without weighing me down – perfect to make spaghetti squash a much more appetizing dinner too! Wow, love that One Hope donates half of their profits to pet adoption- so cool! I will have to look for it in the store next time. 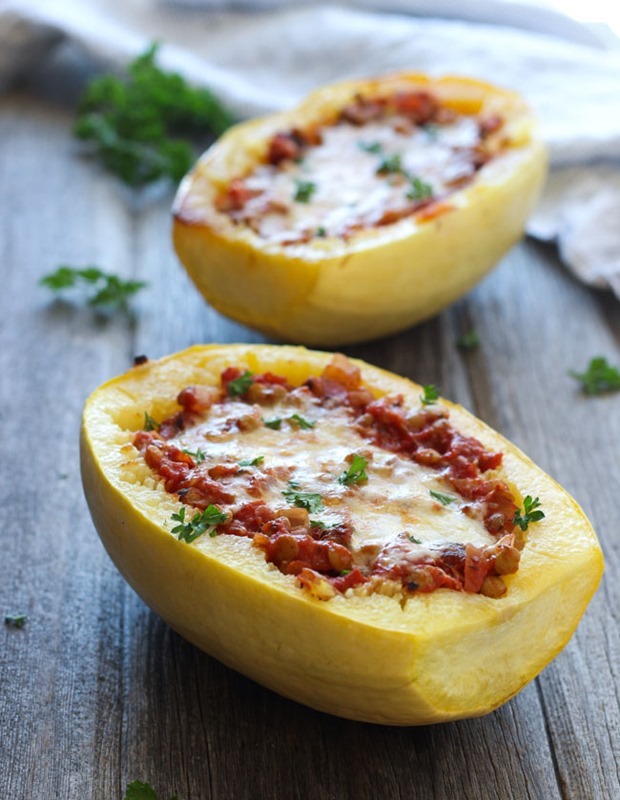 I have been loving spaghetti squash bowls lately- its so comforting especially with the cold temps we have been having! 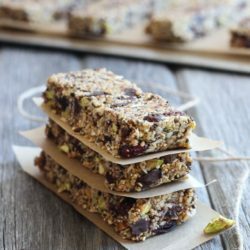 These sound delicious, Sarah! I hope my stores still have spaghetti squash left. I’m thinking it’s nearing it’s prime time. I love the addition of pinot in the sauce. I definitely think it sounds amazing. 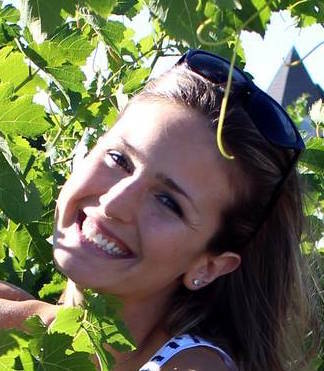 That wine sounds cool, too! I’ll have to look it up. You’re giving me lunch envy! I’m currently sitting here eating some avocado toast with a bowl of tomato basil soup on the side and you’ve got me wishing that I had one of these pas-ghetti bowls in front of me ;) One of these days I -will- work up the nerve to buy another squash… and not let it sit in my pantry so long that it sprouts. Oops. I was just craving pasta sauce with lentils a couple of days ago. Great timing! Ahahaha “Buon appetito miei amori!” You’re officially my favorite blogger on Earth! 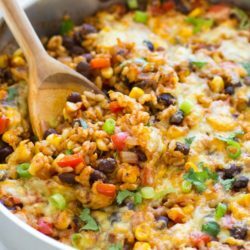 I LOVED your spaghetti squash burrito bowls, so I have no doubt that I would love these. 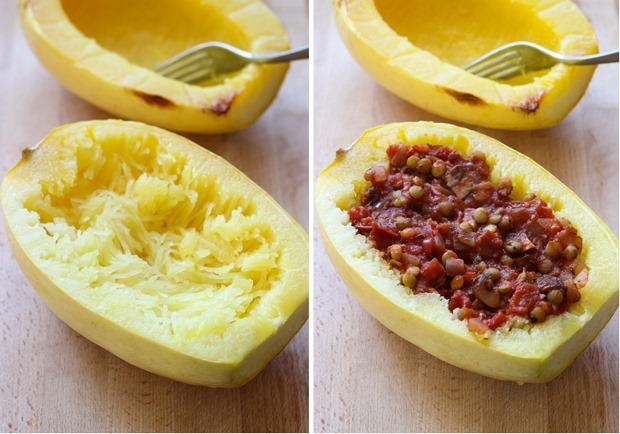 Pretty much anything that involves spaghetti squash and lentils is a winner in my book. I’m so glad that I FINALLY like mushrooms! 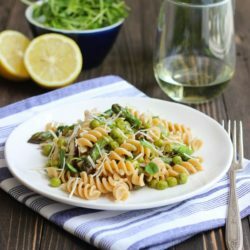 Lentil marinara?! That sounds awesome! And I haven’t had a spaghetti squash in awhile but I love them! Sarah I will be trying this recipe this weekend. I love the addition of lentils. Without spaghetti squash, I would NOT exist!!! What a great presentation idea! I definitely am pinching the idea for next time I’m using spaghetti squash for dinner. Yum, I love spaghetti squash! I distinctly remember having debates with friends when I was really little about the proper way to say spaghetti. Can’t remember if I said it right or not, though, haha. I can’t remember if I pronounced spaghetti correctly as a kid… but I did get bagels and waffles mixed up for some reason and always called one the other! This looks delicious though. I love mushrooms in marinara – they add the best savoury texture and flavour! 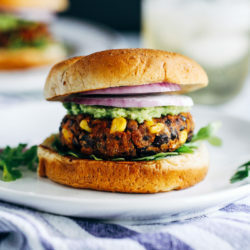 Yummmm!!! 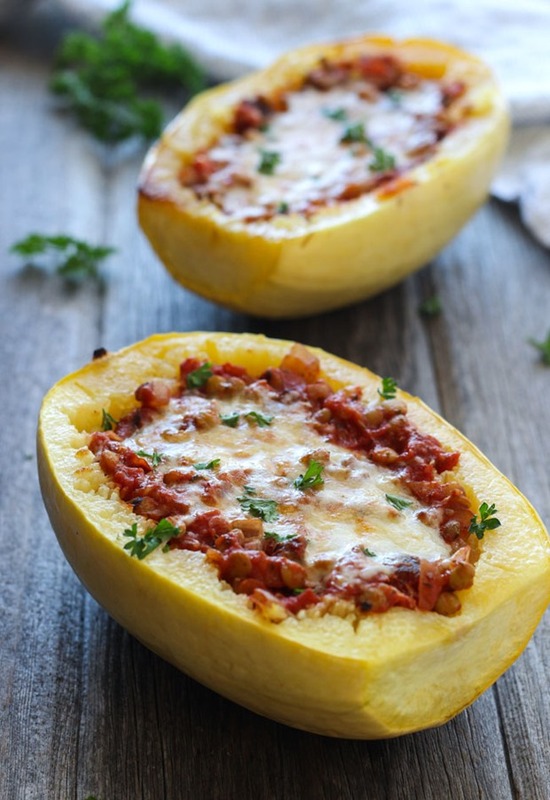 We just had your burrito spaghetti squash bowls again a few days ago and now you have me wanting to make these!! I love that you added the red wine – gah, it’s the best with mushrooms! This sounds fantastic! I love healthy comforting food, Sarah! And Spaghetti Squash is one definitely one of my favourite veggies to eat during these cold days! Pinned! This was OUTSTANDING! So delicious…and I would even make the mushroom/lentil marinara on its own. Absolutely delicious! THANKS! These were so good! The flavors blended together so well! Kudos to you! I was able to fill one squash and then freeze the marinara to use for another time. Thanks! Hi Shyla! I’m so happy you liked the zucchini boats! I still need to go back and update all of my older posts with nutrition facts so I don’t have that information for this one yet. I hope to have it done soon though! Made this today. Absolutely lovely. I hadn’t used spaghetti pumpkin before. Must try some of your other spaghetti pumpkin recipes. I’m so glad you enjoyed it, Marita! Thank you!